My name is Chris Okafor and I am a Research for Development Coordinator at the International Institute of Tropical Agriculture (IITA), Bukavu, DRCongo (DRC). I would like to briefly share a tool we are using to assess farmers’ knowledge gain during training. I am currently coordinating an integrated crops/livestock development project in DRCongo, a position which brings me into contact with small holder farmers. In addition to my doctoral specialization in program evaluation, I have a range of professional experience in capacity building, participatory extension and project management. During my work with farmers, especially farmer training using the farmer field school (FFS) approach developed by Food and Agriculture Organization (FAO), a tool called Ballot Box Test was used to assess and discuss farmers’ knowledge of good agricultural practices before and after training and determine areas of priority attention. The tool was adapted to assess farmer ability to use a mobile phone to seek agricultural advisory services and market information from extension workers and clients. 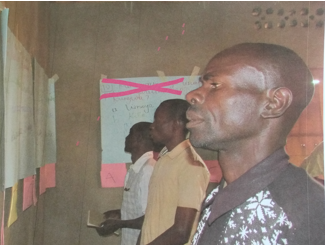 In South Kivu Province of DRC, we took 107 farmers including 49 women beneficiaries of the Crops Livestock Integration Project (CLiP), invited for training in Information and Communication Technology (ICT), through the ballot process. The test consisted of 10 questions, each with three answer options (boxes). Each participant has a unique number written on 10 voting cards (one per question). The ballot papers could have the name of the participants on them. However, this is discouraged to avoid turning it into an examination for the participants. Generally, we have observed that the adults tend to shy away from examinations. Participants go through questions in an orderly manner. At the end of “balloting,” the results were tabulated and discussed in a participatory and interactive manner that helped to identify areas of priority attention. Some were coopted as facilitators because of their level of knowledge. The exercise was conducted again at the end of the training to determine knowledge gain. The Ballot Box method helped us document knowledge change. The pre-training exercise revealed that approximately 74% of farmers knew and understood basic features of mobile phones including saving contacts, placing a call and sending SMS. The post-training ballot exercise recorded an increase of 9%, to 83%. Less than 10% of the farmers knew they could use mobile phones to seek agricultural advisory services including veterinary services and pass on or receive market information. That percentage increased to 85% after training. Hot Tip: Besides establishing gaps in farmers’ knowledge, the Ballot Box Test is a farmer-friendly tool that can be used to stimulate farmer interest in learning, increase what they know and encourage sharing of knowledge. Thanks for sharing about the interesting position in which you are working! The idea of the ‘ballot box test’ is unique and seems to be working very well in your current environment. What is great about this evaluation tool, is that it is adaptable to a variety of situations including my grade 5 classroom! For many students, test anxiety is a real and serious concern, and this way of assessing knowledge would eliminate much of that stress. Students would be able to show their understanding in a quick and easy way. It could help for students who struggle with the physical act of writing as well. It is a fun and engaging way to evaluate the knowledge of students and it offers quick results. I appreciate that you use it both at the beginning of the program for formative assessment and then again at the end to assess the progress and knowledge they have gained. How did the farmers you are working with respond to the test? To what extent were they able to give feedback about their experience? Do you see this being able to be adapted for use with people who are illiterate? You mention that the Ballot Box encourages sharing of farmer knowledge with one another. How have you seen this happening? Thanks again for the intriguing post!